Cake Wrecks - Home - Bakers Celebrate National Punctuation Day?! Bakers Celebrate National Punctuation Day?! 1) Always put punctuation at the end of a sentence. Unless you forget or think it looks better this way. 2) Quotation marks are perfect for emphasizing you don't understand quotation marks. 3) They can also help cover "mistakes!" "That's my nickname for you. That I just made up." 5) Proper punctuation can convey a sense of enthusiasm, so choose wisely!! 6) No one really understands how apostrophes work, so just sprinkle them in wherever. 7) When in doubt, go with a question mark. Inside parentheses. It's not the punctuation Gotham needs. It's the punctuation Gotham deserves. 8) Punctuation is important. Just put it anywhere. Thanks to Linda F?, Jenn M!, Katie* R., Brittany J..., Allison [M], Cherie/, Erin M - , Annie K;, & Patricia C(o.0) for helping us explore the wrecky period. We all know that Courtney's birthday isn't REALLY going to be happy...wink wink. This post prompted me to review some of the “rule’s” of punctuation. The website PeopleWhoKnowHowtoUsePunctuation.com, had these simple; helpful tip’s. When you want to annoy grammararian’s. An ellipsi’s prove’s to be a handy device when you're quoting material and you want to omit some word’s. It also come’s in handy when you’ve lost your train of thought or wish to expre’s’s annoyance, disappointment, or total apathy. There are no rule’s for using the ellipsi’s. Feel free to scatter them “freely” within your written work and over your cake’s. There are many more punctuation rule’s that we should all commit to memory and promptly forget so we can make use of the ellipsi’s (!) The hyphen, the colon, the semicolon, the Oxford comma, and the community college period. can all be used to make our comment’s/cake’s clearer and more entertaining. I know, I, for one, will strive more harder. to use "correct" punctuation, in the future. I love these! posts about grammar'. We allow "children" to use(?) inventive spelling, so why! Not inventive, grammar? Personally I think? it is far/ more interesting to see' unusual grammar/ and it tak'es more effort To, read than Just regular' "old" grammar. Oww, my b'rain hurts/ from making "so" many deliberate e'rrors. Oh, I forgot to add the most important reason today is a holiday: it's my darling husband's birthday. (And of course he has to work 12 hours today. That's why we had the electric-blue cupcakes yesterday. (Might I say, I am FAR from a professional baker, but they looked better than anything we see on here. And no CCCs [patooie!]). If this was a poster, I would hang it up in my classroom. My daily dose of "laughter"....check? errr make that Check! The wrecks are great but the best part of today's post is Jens thank you to the submitters at the bottom. So Jen.../John? ! 'You're' thank/ you! is "spot" on. I love this site. Hi, My name is Cookie and I'm a CAKEWRECKAHOLIC. and a > =^-.-^= (for fillip...or Philip (take you're/yore/ you are/your pick). Jen's hubby already has a parenthetical after his name, but I really think he should consider adding the comma: Joh,n (thoJ). That's much more distinctive. I should give some thought to putting random punctuation in the middle of my very common name. September 24, 2014 | Kim L.
Don't be sad for Jonathan. Remember, in Mama Mia dot dot dot meant someone got lucky! Duh I thought to myself because if I said it out loud she would give me a F. I said this is my Art project. In my most proper indoor voice I told her Through the medium of ‘cake avec sprinkles’ I have symbolically demonstrated and displayed, in a neoclassical way, showing the influence of negative Dadaism as affected by Cubism, featuring slightly overdone Minimalism and using sprinkles as a homage and slight nod to Georges Seurat’s pointillism, a vision of the postmodern world, i.e., a stark place completely devoid of sweetness, as represented by the plain brown cake, symbolizing, of course, the naked earth, and the copious amount of sprinkles, which represent, as you would expect, a collection of millions of ellipses covering the barren earth, indicating something missing, which is what ellipses do. And what is missing is the sweetness, the Sweetness of Life – innocence, kindness, peace, harmony – that no longer blankets the world. My teacher just stood there. I think she was surprised I knew a french word, avec. It means with in french and is the only french I know, except for kissing. So, thank you @SuBee for learning me about those things and what they are and where they go. I am a little confused about the community college period, though. I have a friend, Bubbles, well, that’s not her real name, and she really wants to learn about that. She just started at a community college three months ago and the other day she said Amber’ I’m having a lot of fun at community college but I’m worried, I haven’t had my period yet. PS…I got a A on my project! And Bubbles said she thinks she is getting a Scarlet A. I don’t know what that means, but she doesn’t seem very happy about it. I'm still trying to work out why Cherie IS Congratulation. Is she THAT perky? I'm guessing that "Tori"'s "cake" is a bunch of actual scoops of ice cream in cones. But if they were really icing made to look like ice cream, that would be a pretty amazing fake-out. Also, my brain hurts from reading the comments. In a good way, though. @Subee: That's a classic! [Standing and applauding…and laughing….] And the "community college period" is a priceless gem. I have been controlled by the whims and fancies of punctuation for far too many years, so it was with great delight I threw away my “Elements of Style,” “MLA Style Manual,” “Grammatically Correct, 2nd Edition,” and other reference books that have kept me styntaxically shackled, metaphorically speaking…. From today on and henceforth I am using only your rules! I can breathe easier already! … ‘ ? I, just’ feel…so/free?! And mel? If you are with Amber', does that mean that you are now mel'? SuBee!!! yay!!! Punctullion, punk julian, punk you ate WHAT??? So man,y lauGh's in post's of' ?today! I gotta go read it all again!!! Ouch! The "Grammar Nazi" in me is having palpitations. I've been know to change store signs with bad punctuation, and it was all I could do to keep myself from reaching through the screen and fixing some - or all - of these Wrecks. Thanks for the laughs and groans. Today, Mental Floss (which I love and recommend to all thinking people with senses of humor) informed me that there is now such a thing as an angry period. It looks just like a regular period, but comes at the end of a paragraph. (?!?!) Apparently, the kids don't put periods at the end of their social media paragraphs because it's akin to ending the sentence with PERIOD. I have fever today, so I'm hoping this whole day is just one fever-fueled hallucination. Oh, and nice orange polyester ribbon squeezing through the frosting. Yummy! I had a single heart pang twang when I read the "Good luck / Benita". I was once that cake wreckorator - if that cake wreckorator was actually a 5th grader who had just moved from the USA to France and asked her French teacher, Madame Dumon, what a "virgule" was after Madame Dumont had said there would be "virgules" in our dictation exercise and if Madame Dumont had drawn the straightest, largest, and most tilting-to-the-right comma in history on the blackboard and said "voila - une virgule." I was that same confused kid who, on the ensuing dictation exercise, put 20 forward slashes in where there should have been commas! I feel your pain / Wreckorator / I really do! Love your blog and humor! Some of the these aren't that bad, like the Happy Bosses Day. I can let that one go. Greatest Dad's or Greatest Dads - either one doesn't make sense. That ice cream cake looks good, though! Well, Jonathan's cake certainly has easy to read handwriting. And after spelling "congratulations" correctly, Cherie's decorator deserved at least one apostrophe as a celebratory end zone touchdown dance, so to speak. that would be the best wreck ever! lol...all of this reminds me of Victor Borge's Phonetic Punctuation. Maybe if these wreckers tried reading their cakes with his style of punctuation they'd be able to get it right more often! How do these people graduate 5th grade let alone get jobs as cake decorators? SuBee, I think I need some Advil after reading your comment! Whoa. So. Many. Grammatical. Errors. I think I would develop a tick if I worked in one of the bakeries that produces these, er, unique specimens. Does the left strawberry on the ice cream wreck have mould on it? Can somebody hook me up with a coffee IV? STAT! I'm running on about 3 hours of sleep and have been at the hospital since a little after 3 a.m.. My step-father had a heart attack last night and is currently stable(ish) but it doesn't look good. That being said, reading this post hurt my brain. And the comments have caused a nearly complete shutdown of all cognitive thought. If anyone needs me I'll be in the corner mumbling to myself about Amber and @mel and asking everyone for sprinkles. Once again, many thanks to Jen, john (thoJ) and all my commenting buddies for taking me away from the difficult decisions my family is currently facing. I love you guys! Jodee: I am so sorry to hear about your stepfather. Sending light and love his way, and to you and yours. If you live local to upstate NY, I would gladly hook you up to my coffee machine. Pamtha: your victory touchdown dance comment made me snort! mel': "is the only french I know, except for kissing" - this sentence makes me laugh every time I read it. tha'nK "you"! @Jodee - praying for you, your stepfather, and family! I hope everything turns out OK and he makes a complete recovery. September 24, 2014 | Elizabeth A. @SuBee: Hours and several re-readings later, I’m still laughing at your post – so I have printed it and will frame it. It is just too good not to. @Rachel CrazyMum: hello’ and no, Im not really with Amber’ and am still mel. She just sent me her comment and asked if I thought it would be OK to post it – she’s somewhat shy. I think she just put “avec mel” on it so she could use “avec” twice. She told me she is very proud of her French ability. @VaBeach alemaP: OMG?/! Thank you! This was my first comment and I know people think I’m a Bambi...I mean Bimbo, but inside my skin beats a heart!! The green dots are so cool, too! Sometimes I eat them and then smile at people and they think I have broccoli in my teeth! Ha ha, the joke is on them – I don’t eat broccoli! If we were eating Dots together it would be like a little Christmas party, I mean with the red and green and like Christmas colors, right! I’ll tell Bubbles you said Hi! She’s still sad and misses her relatives, too. Just today she said I wish Aunt Flo was here. Bad bakers! I sentence you all to listen to/watch Weird Al Yankovic's "Word Crimes" one hundred times each. Hugs to,Jodee, and peace to you and your family as you make these decisions. Please keep us posted. a lot of people seem to have trouble with apostrophes. these people apparently work in my local grocery stores. That Jonathan cake is so sad! Perfect decoration, lettering & spelling - the decorator really tried. Then he stood back & saw the spacing wasn't perfect - 'JONATHAN' was too far to the left. How to fill that gap? Not a flower or a heart - that would spoil the design. Exclamation marks? Well, maybe Jonathan's birthday wasn't going to be THAT great. Hey, ellipses! That creates a 'to be continued' feel, maybe they'll order a second cake to fulfil the expectation! Yeah, it could say 'Have a great day' or something. Jodee - we're all with you, right across the globe. Best to you & all your family. I never realized that so many people learned punctuation from that one part of _Flowers For Algernon_ . "'the community college period.'" SuBee, that was genius. Absolute genius. September 25, 2014 | Colin M.
Ah, the post tailor-made for a grammar/spelling/punctuation queen! 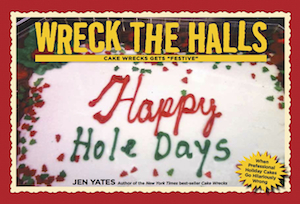 Jonathan's cake is just gorgeous; if only the wreckerator hadn't used the ellipses...but he/she did. Although in regard to the first cake, happy bosses are certainly something worth getting excited about. SuBee, mel, and Amber' avec mel, you have all brightened my day more than coffee could. Jodee, I'm sending prayers and good thoughts your way. If I could, I'd pack up the rest of my coffee and send it to you, but you'd only end up with a package soaked with cold coffee.